The leaves boast more beta carotene than carrots, meaning they are great for healthy eyes! The greens also provide 535% of the recommended daily value of vitamin K, which is vital for strengthening bones and preventing cognitive decline. A 2011 study showed that dandelion root tea may induce leukemia cells to die. Researchers reported that the tea didn’t send the same ‘kill’ message to healthy cells. The plant is a diuretic that helps the kidneys clear out waste, salt and excess water by increasing urine production – perhaps the reason that European children’s lore claims you will wet the bed if you pick the flowers! Animal studies discovered that dandelion root and leaf manages cholesterol levels. Research also shows that dandelion extract boosts immune function and fights off microbes. Dandelion can also help the digestive system according to the University of Maryland Medical Center. Fresh or dried dandelion can stimulate the appetite and settle the stomach while the root of the plant may act as a mild laxative. 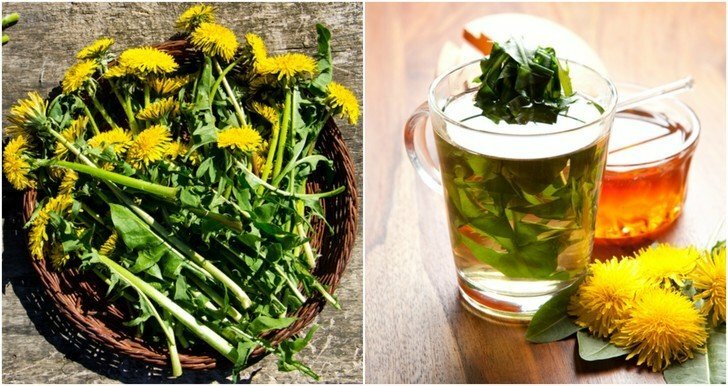 Because the entire plant is edible there are a myriad of ways in which you can use dandelion for culinary purposes that goes way beyond simply making dandelion tea. With their rich mineral and vitamin content, dandelion greens are a healthy addition to any meal. Sautéing with garlic (or ginger or capers) adds flavor and negates some of the bitterness often associated with these leaves. Blanching them by immersing them in boiling water for 20 to 30 seconds helps reduce this acrid taste. Avoid the very mature leaves as these can be too unpleasant for some. This double garlic and greens recipe is a delicious one. This nutritious pesto is perfect for a simple pasta, sandwich spread or veggie dip. Because the dandelion greens have a slight bite, the toasted pumpkin seeds, lemon juice and parmesan are vital to bring balance. Here is how you make it. Fried dandelion flowers, first dipped in seasoned batter, make a tasty, attractive and novel snack or side dish. By removing all the bitter green parts, you’re left with the mild-tasting and faintly sweet blossoms. Follow this recipe here. Enjoy increased wellbeing by using this herbal vinegar on salads, in dressings, soups, stews and sauces or by simply mixing with water and drinking as a revitalizing tonic. Infuse dandelion flowers in apple cider vinegar for four weeks, strain and store in a dark place for up to twelve months. These steps outline how to make the infusion. Cook the flowers and make them into a jewel-like vegetarian risotto. While the dandelions add visual appeal and a mild sweet taste, the onion, wine, stock, creamy yogurt and parmesan lend a rich, deep flavor and smooth texture. The Vegetarian Society inspired recipe can be found here. Instead of the traditional spicy and sour Korean kimchi which is made with cabbage, this foraged alternative uses dandelion greens. Eat your way to good gut health by fermenting the greens with herbs, spices, green onions and soy sauce, as outlined in this recipe. These soaked muffins, made with whole wheat flour, oatmeal, honey and dandelion petals are perfect for serving with Spring time soups such as asparagus or green pea. Learn how to make them here. Make a delicious iced treat from freshly picked dandelion blossoms, sugar, honey and lemon juice. It’s perfect for a summer’s day in the garden, or served after one of the many dandelion-inspired main meals here! You’ll find the recipe here. This delicate jelly is delicious and sweet as honey. Use it on top of toast, crumpets or anything else that takes your fancy. It keeps in an airtight container for up to two weeks – but it definitely won’t last that long! Follow Martha Stewart’s recipe. Love pancake syrup but want to avoid the sickly sweet store-bought variety, which is loaded with nasty artificial additives and preservatives? Then this is the recipe for you! It’s made with just three ingredients – dandelions, lemon and sugar or honey. The two-day process is described here. A sweet, delicious and slightly tropical cake made with dandelion syrup, blossom petals, cinnamon, crushed pineapple, walnuts and coconut, this is sure to be a hit with the whole family. Click here to go to the recipe. Another sweet dandelion based treat, these healthy lemony cookies include organic local honey and oats. The easy-to-follow recipe is found here. As we’ve found out, no part of the humble dandelion has to go to waste. After you’ve sautéed the greens, and used the blossoms in your dessert, hang onto the roots and brew a caffeine-free alternative to coffee. Roast them before grinding for a deep, earthy flavor. Discover exactly what to do here. This pretty iced lime and dandelion tea is so good even the kids will love it. It’s also refreshing, natural and has many skin promoting properties. Blend a quart of dandelion flowers with fresh lime juice, stevia leaves or other sweetener, and dried red raspberry leaf. Learn how to make this healing tea here. Surprisingly, these pesky weeds can make a fine country wine – rich, strong and medium sweet. Head out into the countryside (or backyard) with a gallon container and collect enough complete flowers to loosely fill it. Ferment these with water, lemon zest and raisins for a couple of months before enjoying. The full wine making process is detailed here. If country wine isn’t your thing, perhaps a Danish schnapps sounds more appealing? Make it with the flower heads for a fresh, aromatic and mildly sweet taste which goes well with chocolate, sweet desserts and cakes. Or, for a dry, spicy and very aromatic drink, brew it with the roots. Enjoy the schnapps on its own or serve with roast meat and other robust flavors. The recipes can be found here. Dandelion’s properties extend beyond the dinner table – they can also be harnessed to reduce pain and inflammation, and treat minor skin maladies. Try making this dandelion and coconut oil moisturizer that’s great for dry elbows and feet, helps to relieve sore muscles and aches and can also be used as a lip balm or aftershave. Get the recipe here. Dandelions are one of the most useful plants to reduce joint pain and aching muscles. Infuse the flowers in an oil and rub onto sore muscles and joints, or anywhere pain strikes. To make, simply fill a small mason jar with fresh dandelion flowers and pour in a base oil – like sweet almond or olive – until the jar is full. Leave to infuse in a warm place for two weeks before straining the oil and decanting into a sterilized jar. Store in the fridge. For a full tutorial with step by step photos, click here. For a more portable version of the pain relieving oil, go one step further and turn the infusion into a soothing balm – ideal for carrying in your purse or gym bag, or keeping in the car or office. Create a double boiler and blend beeswax with the infused oil. Pour this mixture into a jar or tin and allow to cool before using. Exact measurements and instructions are here. These therapeutic lotion bars help the toughest cases of cracked, dry skin by adding moisture and alleviating inflammation and soreness. If you’re an avid gardener, or frequently do very manual work, rub the bar over your hands several times a day. It’s a lot less messy than salve! Blend infused dandelion oil with beeswax, shea butter and lavender essential oil for a silky, smooth healing bar. The full process is detailed here. Dandelions are a natural wart remover. You’ve probably noticed that the roots, stems and leaves of the plant exude a white sticky resin – this is the secret weapon against warts. Apply this sap directly onto warts once, or several times, per day and they should soon disappear. Use dandelions to add a pop of color to your home, or some much needed nutrients to the garden. Make a stunning and chic dandelion centerpiece simply using reclaimed wood and small nails. Assemble a box from the wood, hammer small finishing nails through the underside, and slide handpicked dandelions on top – creating a centerpiece that appears to be floating. Find out more here. Cook dandelion heads for an all-natural alternative to chemical-based dyes – which can contribute to water pollution. This is an especially useful tip for those who weave their own wool but can be used on any garment. Here is how you can use the dye to brighten up your fabrics. A liquid fertilizer, or ‘weed tea’ is simple to make and will give your garden a boost of nutrients. Deep rooted dandelions are especially valuable weeds as they are so nutritious. Since you can’t toss them into the compost pile as their seeds are still viable, brew up this organic fertilizer instead and pour or spray it onto flower beds and vegetable gardens. Here is the simple process for making the fertilizer. If you keep goats (and here’s why you should!) then you’ll know that they need a diverse, vegetarian diet. Use your unwanted dandelion weeds to form a portion of that balanced diet. Research has shown that animals choose what to eat based on their individual nutritional needs so if you simply leave the dandelions for the goats, they’ll most likely munch on them and save you the job of weeding!